Hate To Exercise? How To Get Started & What To Do! One of the most difficult parts of weight loss is deciding what to do when you hate to exercise. You know what it takes, though it feels like a drag because you just want to lose weight fast and without having to exercise at all. Unfortunately, weight loss rarely works like that. So, you need the best solution for how to lose weight with little effort. HERE IT IS ... FOR THOSE WHO HATE TO EXERCISE! I think the easiest route to establishing a fitness routine is to join a gym and have them help you get started. Most gyms offer free consultations with personal trainers. They are happy to walk you through the best machines for you and instruct you on how to get started. You can either choose to continue working with the personal trainer or go off and do what they taught you for a while until you start losing weight and getting toned. You can always contact the personal trainer later if you need more help for advanced fitness goals. Gyms are the ideal solution for most people that hate to exercise because they have all of the free weights and fitness machines that make it easier on you. Some of the local gyms also offer exercise classes, swimming, sauna, tanning and babysitting. These amenities provide variety and motivate you to get to the gym regularly. Plus, you don't want to pay for a gym membership and not use it. Monthly fees are lower than they used to be, though still a constant reminder to get to the gym and work on your weight loss goals. 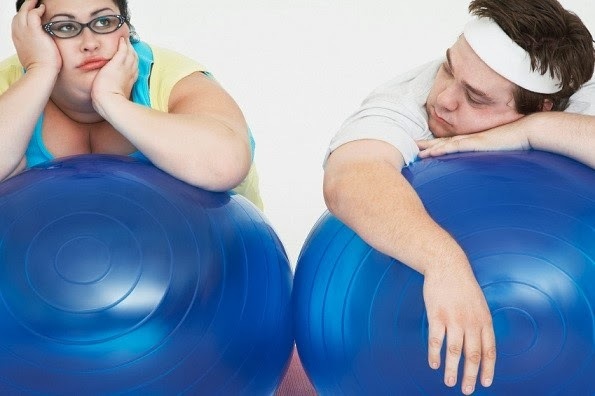 Joining a gym is the easiest solution for how to start exercising when you do want to, though obviously not best option for all people or we'd all be gym fit! What if you don't like the gym? What if you can't afford to join a gym or don't want a monthly fee? What if you're too embarrassed to go to the gym? What should you do if you hate to exercise at all? Exercise is essential whether you can afford a gym membership or not. There are a lot of different fitness options to choose from, but first you need to get your head right! You have to make sure that excuses not to exercise are out the door, so that you can choose what type of fitness routine you can stick with. If you hate exercising then you need to hang around for a while - subscribe to this blog and save this page to your favorites for later - because this is a subject I will touch on often. I will add more ideas and resources to this page because hating to exercise is common for people who need to lose weight. On the other hand, exercise is essential for optimal health now and later in life. If you are a parent, please keep in mind that this dislike for exercise is carried over to your child(ren) and puts kids at risk for obesity. You don't want that do you? It is the high price of hating something so good for you! How To Start A Fitness Routine When You Hate To Exercise? This is the most difficult question to answer because anyone can tell you what you need to do, but YOU have to make the decision for yourself. You have to decide not to ignore your doctors recommendation or your jiggly arms or spare wheel around the midsection (fat belly) or aching back, etc. You just have to commit to doing at least 20 minutes or more of exercise 3 or more times a week. Clean eating or certain diets online do not help most people accomplish their weight loss goals. Some people start losing weight by watching what they eat, though end up needing cardio and strength training to drop weight and tone up. This can very well be the case for you if needing to lose a lot of weight, therefore you have to exercise. Above all of the reasons why exercise helps with weight loss, keeping your body strong, flexible and toned will make such a difference in whether you age gracefully or not. Exercise can literally save your life when you do get old. So, understanding the lifelong benefits and committing for your health are the first steps in how to get started in a fitness routine when you hate to exercise. Here's a guide to help stop the hate for exercise and how to get started. #1 Decide to start exercising because it is good for you! Whether your doctor has told you that you need to exercise for weight loss / health needs, or you know that you need to exercise and are trying to work through this on you own, you need to plan how you will get started and what you will do. You are here because you want to know what to do to get started in a fitness routine because you hate to exercise, so don't leave this page without deciding that you will start exercising tomorrow with the information and one of the suggested exercises on the list below. Most importantly, since exercise is good for you, you have to make yourself like it by choosing what you can comfortably do and make yourself stick with it. #2 Make an exercise schedule that works for your lifestyle! Fly by night decisions are NOT useful right now. In addition to committing to exercise, you have to set realistic goals and expectations for yourself. As mentioned above, it is easier for some people to join a gym and work within the guidelines of their class and training schedules. Still, whether you join a gym or not, you need to find which times are manageable around your work, family and activity schedules. Pull out a piece of paper and a pen to write down your schedule. What times do you have in between everything on your schedule? Are there activities or bad habits that are taking time from when you can exercise? Are there times when you can combine efforts? For example, do you watch certain shows on certain days? Maybe those will be the best time to get in your cardio, squats or exercises with weights. Do your children have practices or classes of their own where it is really not required that you sit and wait? Maybe you can do both by watching for a while and then taking a fast walk before his or her activity changes. Maybe you can squeeze in a 1/2 hour before showering for work? You may not want to exercise this early, but if that is the time slot available in your busy schedule, then it may have to do no matter what. Stop in at the gym or get up off the couch 3 to 4 times a week even if it has been a hard day at work. I hope you are getting the point here. You have to find pockets of time in your schedule, maybe trade one for the other, because it is better for you. Who cares that you hate exercising ... Just do it! You have not even started again yet and may find some new fitness options that you actually do like, but you won't unless you commit to making the time and doing it! Need some motivation to get started in losing weight? Come join our Weight Loss Challenge with information, support and prizes! Hate Exercising? Here's What To Do! As mentioned above, you can join a gym and let one of their fitness professionals tell you which exercises to do. This is such an easy way to get started in a fitness routine that is clear and do able. In fact, some gyms offer free membership days where you can get this information and also determine whether their particular gym works for you or not. Let them know you hate exercising and see what they come up with for you :) Don't let them push you into a membership until you have decided which location is best for you. Just relax and really pay attention to everything (from the friendliness of the receptionist, to the cleanliness of the gym, to the personal trainer that helps you get started, the clientele and how you feel working out at their gym. Try some fitness classes, pool and / or sauna. This is one of those potentially life changing decisions (like purchasing the right home or the most comfortable shoes in your life), therefore treat it accordingly and don't shop on impulse. If that gym kind of feels like a home away from home - per say - or will suffice, then you may have found the right one, but still check out a few more to make sure. Go as often as you are told. If you have already done your gym tour(s) and initial consultation(s), then you know what you need to do, then get to it! In addition to all of these exercise options, aggressive housecleaning and gardening give a powerful punch to calories, so don't forget to calculate these as exercises once or twice a week. You can also wear arm and ankle weights throughout the day. You'll be amazed at how much this extra weight helps with burning and toning; especially arm weights. Whatever you choose, you have to STICK WITH IT and make yourself love being active again. Remember what you use to think of as fun (yes, go back to childhood if need be) and do it again - learn how to play again - these are the best exercises for you! I genuinely hope that you've found this post helpful in working on your hate of exercise. Let us know what you've applied and which exercises you are doing! Please let me know if you notice an exercise is missing from this list and if you specialize in an area of fitness that would help my blog readers? Maybe we can coordinate a guest post for your specialty. Leave a comment below to let me know how you're doing!